THE north ATLANTic Oscillation (NAO) is quasi-periodic shifts in the relative strength of the quasipermanent centers of high atmospheric pressure over the Azores and low atmospheric pressure between Greenland and Iceland (the Azores High and Iceland Low). It is a major large-scale mode of the atmospheric circulation over the extratropical ocean in the Northern Hemisphere. The NAO intensity is at a maximum in winter. It governs the large-scale variability of hydrometeorological fields over the North Atlantic, North America, and northern Europe, as became clear after a pioneer paper published by Sir Walker and co-author in 1932. Recently, the NAO has been set in a broader spatial context of hemispheric climatic variations, both at the surface and aloft as follows, for instance, from generalized publications of John Marshal, et al., and Alexander Polonsky, et al. As a measure of NAO, a special index is often used. This index is the normalized (by standard deviation) difference between sea-level pressure (SLP) in the Azores High and Iceland Low. Difference of absolute values of SLP between Azores High and Iceland Low is a similar measure of NAO. It is sometimes called the Rossby index (in memory of famous meteorologist). The annual mean value of SLP in the Azores High 1890-1990 was about 1024 hPa, while in the Iceland Low it was about 1006 hPa. So, the yearly difference of SLP in the Azores High and the Iceland Low is about 18 hPa. Amplitude of annual harmonic of the Rossby index is about 5 hPa. The amplitude of the semi-annual harmonic is about half the annual one. The Rossby index value is calculated as the SLP difference between meteorological stations situated in the vicinity of the Azores High and the Iceland Low (for example, Lisbon, Portugal, and Reykjavik, Iceland) is smaller by a few hPa in comparison with the value calculated as difference in centers of atmospheric action defined as positive and negative extremes of SLP in the subtropical and subpolar North Atlantic region. It is as a result of the temporal and space migration of atmospheric centers of action. The study of displacement of the centers of Azores High and Iceland Low using approximately 100-year data sets provided by Hunter Machel et al. and Alexander Polonsky et al. has shown that just the space state of these centers during different NAO phases plays the important role in generating of European climatic anomalies. The NAO index (NAOI) has two relatively stable states, positive and negative. They are due to high and low NAO phases. The positive NAO phase is characterized by NAOI values exceeding the mean of the NAOI by the standard deviation or more. The negative phase is characterized by the opposite conditions. Long-term series of the NAO index show that it varies at all timescales, from days and weeks, to decades and longer. Typical scales of NAO variations that influence strongly the European climate are the interannual-to-decadal. 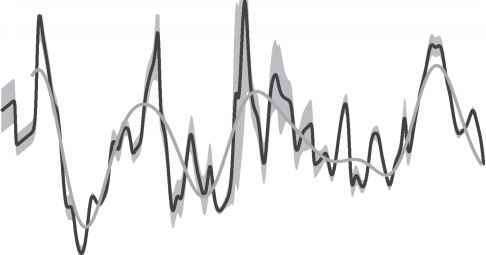 Spectral and wavelet analyses of fluctuations of the NAO and Rossby indices for more then 100 yeas between the late-19th and early-21st centuries reveals dominant significant peak at the periods of approximately six to nine years. The same scales of variability are typical for different hydrometeorological fields over most of Europe. NAO dominates in winter, when a significant portion of North Atlantic and European climate variability is due just to NAO.